Can Living with Someone Jeopardize Your Alimony? Divorce is a shock to a person’s finances, and one way some spouses with limited resources bridge the transition into singlehood is through spousal support or alimony. Alimony is, by and large, a temporary, but essential, form of financial assistance that many former spouses need until education and/or more secure employment is obtained. Alimony is intended to provide the recipient with the level of support he/she would have enjoyed if still married, with the expectation that other available sources of income are not available. Most forms of alimony are modifiable and/or subject to termination if circumstances change, but one situation that is most likely to convince a court that alimony is no longer necessary is cohabitation by the recipient. Since the point of alimony is to provide missing financial support, living with a new intimate partner, who is presumably contributing to the household expenses, would seem to eliminate this need. Proving the existence of a supportive relationship is not necessarily easy, though, and judges will expect to see more than rumors or circumstantial evidence a former spouse is living with someone new. Both parties have a lot at stake with the issue of alimony, and a discussion of the standard to a modify or terminate an alimony award, as well as how courts evaluate claims of a new supportive relationship, will follow below. Alimony awards are based upon a spouse’s need for support, and the other spouse’s ability to pay. Thus, when unanticipated circumstances change the financial abilities of either party, a court may order a modification or termination of the award. Typically, changes in employment, remarriage, death of a former spouse, or living with someone in a supportive relationship are the principal reasons a court would consider making a change, including a reduction in amount or complete termination of the support. Of these reasons, supportive relationships are the hardest to prove, and the claim most likely to produce intense litigation. How much the coupled has supported one another, both mutually and individually, among other related factors. 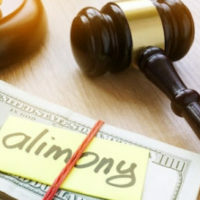 In essence, the court will assess whether the new relationship has functionally replaced the financial support provided during the marriage so that alimony is no longer required. The facts and circumstances will vary in each case, but an experienced family law attorney will know how to use this information to secure a favorable outcome. If you have questions about alimony or another post-divorce judgment issue, talk to a knowledgeable family law attorney to see what your options are. The attorneys at the Donna Hung Law Group understand the complications former spouses can encounter with post-divorce support awards, and can help you get a fair result. Contact our Orlando law firm at (407) 999-0099 for a consultation.